Veering hard on the horror side of the gothic genre, The Shining takes a modern setting (well, it was modern in 1977) and makes it far more terrifying than an antiquated castle could ever be. 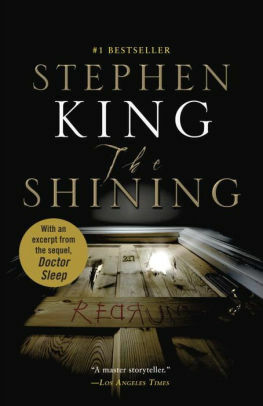 A town cut off by snow and the faded glory of the Overlook Hotel build the atmosphere in Stephen King’s masterpiece, but for me the real meat of the story is in the family drama. How many of the strange goings-on in The Overlook spring from the imagination of a troubled child? Is the father and caretaker Jack Torrance possessed by something dark, or are we just witnesses to his tragic descent into alcoholism? This is horror with a beating human heart. The Shining is among Jeff Somers's five books totally unlike their adaptations, Sam Riedel's six eeriest SFF stories inspired by true events, Joel Cunningham's top seven books featuring long winters, Ashley Brooke Roberts's seven best haunted house books, Jake Kerridge's top ten Stephen King books, Amanda Yesilbas and Charlie Jane Anders's top ten horror novels that are scarier than most movies, Charlie Higson's top ten horror books, and Monica Ali's best books.